At Loyalogy we specialize in loyalty program management with an emphasis on intelligent data analysis to help companies find useful and actionable insights from the tons of data that loyalty programs yield. Over the years we’ve found that many companies have sparse loyalty program metrics they monitor consistently over time. Others produce a variety of spreadsheet reports with loyalty metrics that are e-mailed around their company on a weekly or monthly basis but have no consistent or effective tool for looking at trends over time. To fill this gap we’ve just released the first version of the Loyalty Program Dashboard for Loyalty Rewards Programs. Our Dashboard tool was developed specifically with location-based loyalty programs in mind. Since we’re heavily focused on the restaurant industry, we were focused on the needs of restaurant loyalty program operators in the development phase. However, this tool is also quite relevant to other location-based business categories that operate customer loyalty programs such as retailers and hotel chains. The Dashboard consists of four interactive components to help monitor what’s going on with a loyalty program. Two are location based modules that look at location metrics for a specific week or to drill down and review the trend at a specific location over a range of weeks. The other two modules are segmentation based and look at active members for a specific month or a range of months and group those members into a visit-based segmentation. Segmentation percentages – percent of total members and percent of total spending. 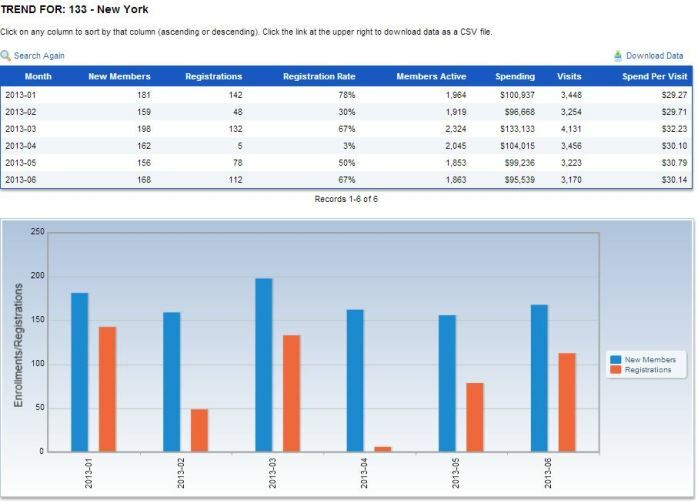 The Dashboard tool is accessible online and companies who use the tool may have as many registered users as they need. Instead of searching around for spreadsheets, marketers and managers have one place to go to find all of the historical data in an interactive format. Data is presented in tabular and graphic form with options for “on the fly” interactive sorting and downloading data in CSV format for offline analysis and reporting. We make it easy for marketers to use the tool by handling all of the data imports (we get the data from their loyalty platform/system using credentials provided by the client) and updating the Dashboard on a periodic basis (we have weekly and monthly options). We have a demonstration version of the dashboard that interested marketers may access to see how the Dashboard tool works in action. It’s populated with 12-months of fictitious data for a fictitious loyalty program. It consists of the basic modules, but most companies need their own variations and customizations of these basic modules or new custom modules. All of these variations and customizations are addressed during the initial system setup phase. Interested in using the demonstration version? Simply visit http://dashboard.loyalogy.com and set up a free account (name, company, e-mail address, password). You’ll be able to login right away and evaluate the Dashboard to your heart’s content. If you’d like to discuss the Dashboard or any other loyalty program related services or have questions, please feel free to contact us.